A couple of days ago I went to this philatelic friend of mine to look at his Wilding collection and was struck as by lightning when I saw that one of his first day covers was postmarked 'Machynlleth'. I tell you, it did open the gates and let memories flood in. You see, my first proper address in Britain was a romantic hillside cottage in Dolyronnen, Machynlleth! And the funny thing is that it came straight after this other guy told me one could never put together a ten page display on Wales, which I disputed by the way. So, to put him in the wrong, and to ride on the waves of a romantic past for a bit, here's a few Welsh momentoes. 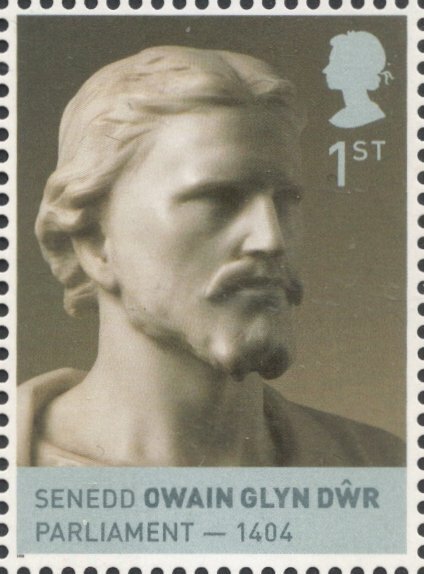 Machynlleth is known for being the seat of Owain Glyndŵr's parliament. 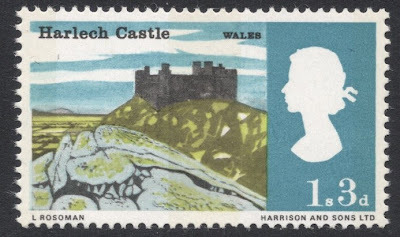 At the time I was there, Wales marked the 600th anniversary of him becoming Prince of Wales. Royal Mail declined the request for a stamp, so the Welsh made their own. They were sold at the tourist information centre in Mach and of course we all agreed that we should use those rather than any British stamps! Glyndŵr had already been featured on a stamp, in 1974, as part of the Medieval Knights set, but rather anonimously. Since then, he has been given a bit more prominence, by being included in one of those miniature sheets from the recent Kings and Queens sets. But, unfortunately, at that time we couldn't actually use these Glyndŵr cinderellas and the Post Office in Mach just continued selling its normal British stamps. Even when the supermarket they were in was undergoing major building work. We had to temporarily enter the Post Office bit of the building, which was kept open, through a back door in some obscure alleyway. To guide us there, there were 5ft big signs showing us where to go. It took a lot of pleading but after the building work was finished and the signs had become obsolete, I managed to get one! Can't do anything with it, but I'm attached to it, so it's folowed me wherever I've been since. From Machynlleth, we often took the train to Harlech, my favourite coastal town in Wales. 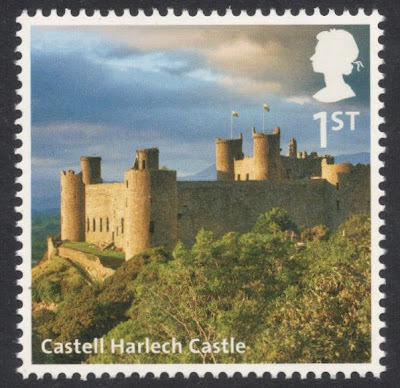 It is of course known for its impressive Harlech Castle, which featured in yet another recent series, Britain from A to Z. 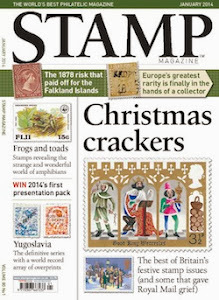 But to be honest, much as I like this stamp, I think I prefer the slightly more nostalgic 1960s version. During my time in Wales, the still current regional 'Emblems' were introduced, in 1999. Being a fan of Machins, which they replaced, I wasn't quite sure it would be a good thing, but once I saw them I was hooked. And I still am. Believe me, I have tried, for obvious yet rather silly reasons, to convince myself I now like the Scottish ones much better, but I've failed utterly. 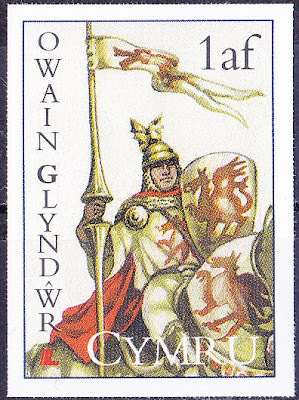 The Welsh ones are so beautiful and to the point, that I would still be collecting them if only they hadn't spoiled them with introducing white borders in 2003. But maybe it's for the better, now at least they're inextricably linked to my years over there. 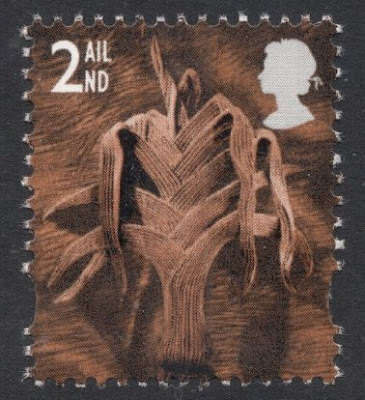 And so we have the second class value which depicts the Welsh Leek. This leek is carved in Welsh sycamore by David Petersen. 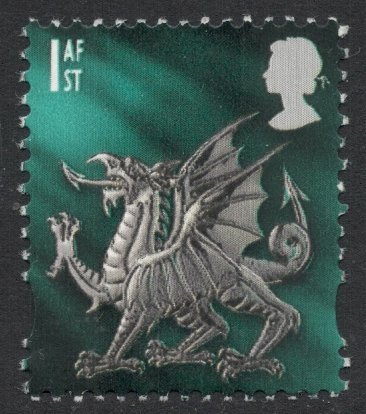 The first class stamp depicts the Welsh Dragon. This, too, was made from Welsh material, the beastie being forged from Welsh steel by Toby and Gideon Petersen. The Welsh Daffodil was found on the E (urope) value. It was created in Welsh slate by Ieuan Rees. 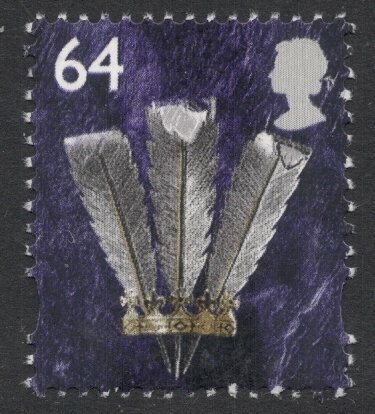 The final value, the 64p, depicted the Prince of Wales Feathers, which were crafted from Welsh gold and silver, by Rhiannon Evans. Aren't they beautiful?! I forget about them when they're in the stockbooks for too long, but everytime I look at them, I fall in love with them all over again. Must get them out and mount them properly, preferably as a ten page display, which I will then show to anyone daring to mock "Mae hen wlad sydd yn annwyl i mi"! PS: Okay, I just can't let go yet, so I've started a special forum thread on Wales. 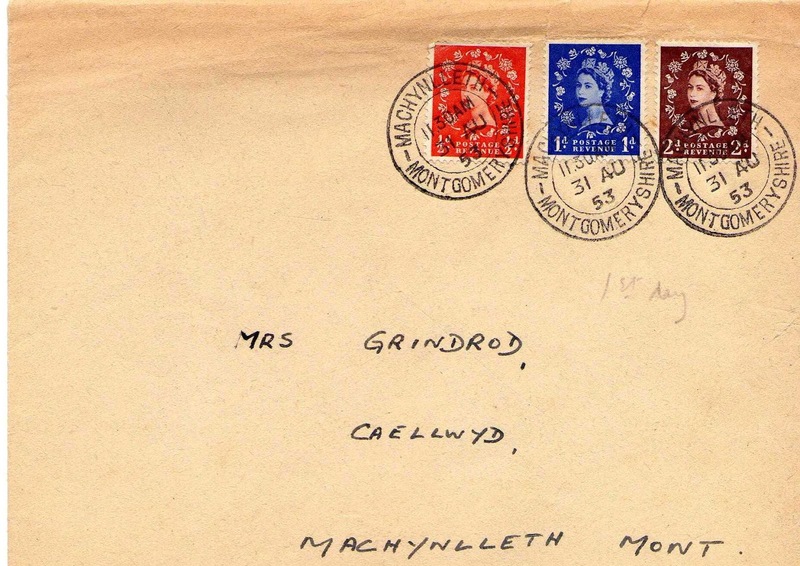 Have a look here and join in by showing your Welsh philatelic material! 1. A while back (I can't remember when, several years) someone sent in one of the Owain Glyndwr labels as a Q & A. Nice to have more info about it. (English people may be more used to seeing his name rendered as Owen Glendower). 2. 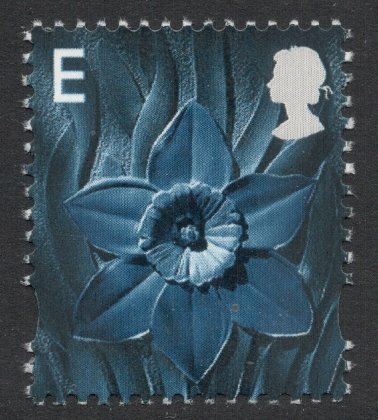 When I read this post before it was published, I told you I didn't think the leek and daffodil stamps stood out enough for definitives. You disagreed with me. I thought it would be worth reviving that argument in the comments, and seeing what other people think. I love the Welsh dragon definitive! You missed out one of my favourites... "Caernarfon Castle" from the Castles definitives series. Sorry, William! Hope I can make it up by showing them on our Wales forum thread. See you there!